In an astonishingly contemporary means of communication, the Seder uses all the weapons in the multimedia arsenal to project its message beautifully and clearly. If we tap into that wisdom, use our Passover prudently to progress and to reject culturalism, then we are assured of greater success in creating the Jewish future. http://www.JewishWorldReview.com | Passover is an amazing experience for every Jewish family. The preparations are the most demanding of the year  the house sparkles, the table set and the horseradish grated. We have put days or even weeks of planning into readying our homes for the holy week and making the Seder into a night to remember. These are amongst the most precious moments of Jewish family life  ones that we treasure and hope our children will want to recreate for their own families. The Torah's wisdom in communicating its message never fails to amaze me. We don't, of course, always see the Passover Seder in this light. But there is no doubt  it is the moment at which we are supposed to transmit the background, purpose and focus of Judaism to the next generation. We are Jewish and are proud to be so because this feeling and message was communicated to us, and Judaism will only survive if we succeed in passing this enthusiasm onwards and downwards. Each one of us is a link in a very long chain, starting at Mount Sinai and ending with us. A chain is, of course, only as strong as its weakest link, and if any of the links are severed, the whole chain will fail. Why is it that so many of us feel so Jewish, but are not succeeding in transmitting and maintaining our Jewish life? I would like to suggest something that is controversial, but I feel is true nonetheless. That is that tying Judaism, deliberately, or mistakenly, to any one set of cultural or social circumstances is a recipe for disaster. This merely produces a transient feeling of ethnicity, something that is sure to dissipate when these circumstances change. Many of our grandparents grew up in very 'Jewish' social circumstances in immigrant neighborhoods. Some of them were observant, others were not, but a range of cultural experiences tied them together. They lived in close proximity to each other, did the same type of jobs, shared the same poverty, and experienced the sights, sounds and smells of a Jewish cultural life. Their picture of 'Judaism' was very much painted by these experiences. But times change, and people move on and hardly anyone still shares this particular range of cultural circumstances. People are more spread out, more affluent, more widely and openly educated. They have many positive experiences of the gentile world. In these new situations, they cannot transmit their perception of Judaism to their children, for it is predicated upon a world which has gone; a set of social conditions which do not exist now and will not exist again. Nostalgia does not move our children. Indeed, even nostalgia isn't even what it used to be! A culturally based phenomenon must die together with the social conditions that spawned it. Jews throughout the ages have made the mistake of tying their Judaism to experiences that were transient. Those who have seen, appreciated and observed Judaism as a system of rules and concepts which transcend any specific location, time or environment have survived. Alas, those who have not have faded out of business. Passover, and particularly the Seder, is a time when one can gain inspiration as to how to avoid this trap. The Seder is the original all-singing, all-dancing multimedia experience geared to handing real, undiluted Judaism in its pristine form to the next generation. And this is something we all want so dearly. If we expect a child to understand Judaism, we must present its origins  we need to know from where we have come before we can appreciate where we are going. We must put ourselves in context, as a link in the above-mentioned chain, as both a receptacle and a transmitter of our tradition. If we expect our children to maintain separate identities as Jews, then we must tell them how we became separate, the goal of that distinction and why it is worth anything in this cosmopolitan world. The narrative of the Haggadah, its themes and symbols seek to achieve just this appreciation. But of course, the intellectual realization of the value of Judaism is insufficient. We are not purely intellectual, but need emotional and physical experiences as well. 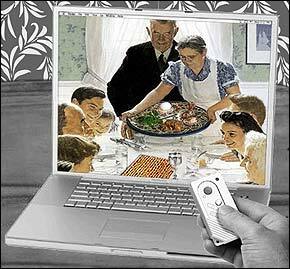 Thus, the multimedia part of the Seder's genius. Compare reading a story to a child without pictures and reading the same story with pictures. The version with pictures penetrates far more deeply into the child's consciousness than the one without. Hence, the Seder plate, replete with symbolism, to illustrate the story. We smell the foods, savour or wince at their familiar tastes, sample their textures, hear the songs, see the symbols. We are completely engaged  mind, body and soul  in reliving and deepening our appreciation of this age-old tale. In so doing, we transcend our time, culture and society and pass on (or should I write Passover) those values, concepts and messages which are the only way to maintain Judaism. History, past and recent must compel us to the conclusion that any other attempt or methodology has failed and will fail. As I mentioned, I marvel at the insight and wisdom that the Torah and its sages devised to maintain itself. JWR contributor Rabbi Harvey Belovski is spiritual leader of Golders Green Synagogue in London. Comment by clicking here.